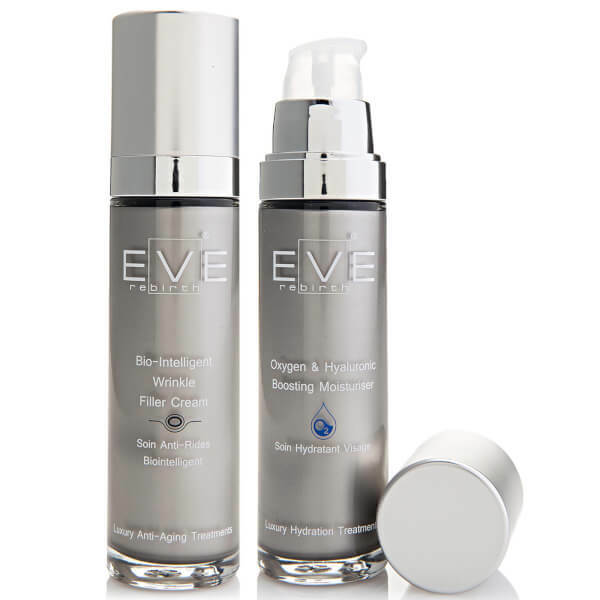 Restore youthful vitality with the Eve Rebirth Repair & Hydrate Luxury Kit; two of the brand's high-performance skincare formulas to target signs of ageing. Combines a wrinkle-fighting cream and oxygen-boosting moisturiser that work in tandem to firm, refine and hydrate your complexion. A revolutionary anti-ageing moisturiser that utilises Biointelligent Microingredients to target the source of ageing under the skin. Helping to combat fine lines, wrinkles and age spots, the cream contains dehydrated and cross-linked Hyaluronic Acid microspheres that perform a filling and plumping effect, whilst a combination of Vitamin C and E protect against free radicals and brighten the complexion. Targeting problems at the source, the super-hydrating formula will deliver localised wrinkle treatment beneath the surface whilst firming, rejuvenating and calming the skin. An innovative formula that works to optimise the skin's use of oxygen for a rejuvenated, brighter-looking complexion. Specially formulated for those with active or intense lifestyles, the cream works to moisturise and firm the appearance of skin; its dose of Hyaluronic Acid attracts and preserves moisture whilst plumping out the appearance of wrinkles, and a cocktail of organic extracts improve tone and protect the complexion. The moisturiser contributes to boosted oxygen consumption, and may help to prevent the formation of pigmentation. Cream: Apply a small quantity of product every morning and evening on well cleansed face and neck. Massage with round movements until completely absorbed. Moisturiser: Use morning and evening. Apply to a clean face and neck. Massage with round movements until completely absorbed. Cream: Aqua (Water), Propanediol, Polyglyceryl-6 Distearate, Cetyl Palmitate, Glycerin, Coco-Caprylate, Dicaprylyl Carbonate, Ethylhexyl Palmitate, Dimethicone, Cyclopentasiloxane, Polymethylsilsesquioxane, Sodium Hyaluronate, Echinacea Pallida Extract, Achillea Millefolium Extract, Calendula Officinalis Flower Extract, Sodium Ascorbyl Phosphate, Tocopherol, Copper Heptapeptide-14 Pantothenate, Heptapeptide-15 Palmitate, Jojoba Esters, Sorbitan Olivate, Sorbitan Palmitate, Cetyl Alcohol, Polyglyceryl-3 Beeswax, Xanthan Gum, Sodium Stearoyl Glutamate, Sorbitol, Trihydroxystearin, Glucomannan, Dextran, Helianthus Annuus (Sunflower) Seed Oil, Tetrasodium Glutamate Diacetate, Citric Acid, Sodium Polyacrylate, Lecithin, Parfum (Fragrance), Lactic Acid/Glycolic Acid Copolymer, Polyvinyl Alcohol, Polysilicone-11, HDI/Trimethylol Hexyllactone Crosspolymer, Phenoxyethanol, Ethylhexylglycerin. Moisturiser: Aqua (Water), Propanediol, Cetyl Palmitate, Polyglyceryl-6 Distearate, Coco-Caprylate, Caprylic/Capric Triglyceride, Glycerin, Dimethicone, Cyclopentasiloxane, Polymethylsilsesquioxane, Sodium Hyaluronate, Glycogen, Achillea Millefolium Extract, Echinacea Pallida Extract, Calendula Officinalis Flower Extract, Magnesium Ascorbyl Phosphate, Sodium Ascorbyl Phosphate, Tocopheryl Acetate, Tocopherol, Yeast Ferment Extract, Mannitol, Sorbitan Olivate, Jojoba Esters, Cetyl Alcohol, Polyglyceryl-3 Beeswax, Sorbitan Palmitate, Helianthus Annuus (Sunflower) Seed Oil, Sorbitol, Xanthan Gum, Sodium Stearoyl Glutamate, Tetrasodium Glutamate Diacetate, Citric Acid, Sodium Polyacrylate, Lecithin, Parfum (Fragrance), Polysilicone-11, HDI/Trimethylol Hexyllactone Crosspolymer, Phenoxyethanol, Ethylhexylglycerin.